Set-cd-rom-speed is an application for setting CD-ROM and DVD-ROM drive speed, written in Kommander. Since the issues mentioned here apply to CD-ROM and DVD-ROM drives as well as to recorders for these types of media, in this document the name 'CD-ROM drive' will be used to refer to all of these drive types. Fast CD-ROM drives have one big disadvantage over older and slower models. In order to be able to support high data transfer speeds, the CD-ROM disk must spin very quickly in the disk drive, which results in a lot of noise. This loud humming can make listening to MP3 or OGG music from CD-ROMs a very unpleasant experience and is very annoying at best for other tasks which don't require the CD-ROM to work at full speed. Using set-cd-rom-speed, you can decrease the drive's speed and thus reduce the annoying noise. The GUI allows choosing three predefined speeds suitable for different tasks and custom speeds provided by the user. The list of available CD-ROM drives is generated based on information from /etc/fstab. This works even if you use supermount-ng for mounting the CD-ROMs. The program supports multiple languages and comes with several translations. It also integrates with KDE by adding an item which allows setting drive speed to the context menu of CD-ROM and DVD-ROM drive icons displayed on the desktop. Set-cd-rom-speed is free software, licensed under the terms of the GNU General Public License. 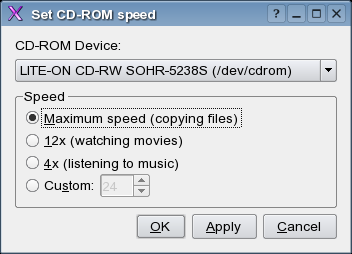 For more information, visit Set CD-ROM Speed homepage (hosted by kde-apps.org).